This is a grid of covers from i-D magazine. 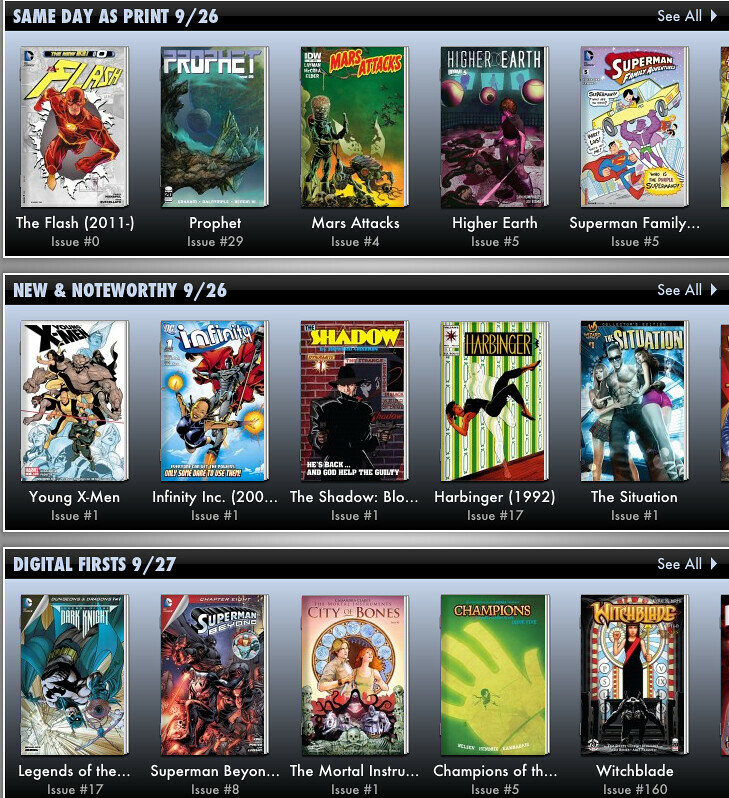 Front page of Comixology on the iPad. The cover images are actually bigger than the ones in the i-D screenshot. I shot this at random, having thought about it while flicking through the new releases. Now, how do these covers work, reduced to smaller size and mixed together like this? On the understanding that none of these images have been optimised for the Comixology shopping UI. And, therefore, that if anything works here, it’s by dumb luck. In tiny little box form, many of those i-D covers are more visually legible/parseable than the comics covers. I can’t even make out some of the logos here. Thank god for the handy text underneath each one. Although I’d have to click through to discover what those CHAMPIONS OF TH are actually champions of. EVIDENCE: nobody optimises their covers for Comixology. Why? God only knows. My presumption is that big important publishers can’t spare a person to do the cutting or create a workflow that creates a thumbnail image suitable for the Comixology app. A zoom-in on part of the cover, or even clipping a bold image from the inside, and getting an optimised version of the logo on it…. apparently that’s too much work. Most publishers simply don’t want digital sales enough. It’s the usual assumption of “if you build it, they will come." Which is why digital sales on monthly books are still (I am told) no more than a fifth of print sales. LESSON: five minutes’ work will get you a thumbnail that works better in the Comixology store than 95% of the covers around you.